One of my favorite concepts. My main complaint was that once the car was driving on the sidewalk you could move everything out of the way. Making the game far to easy. 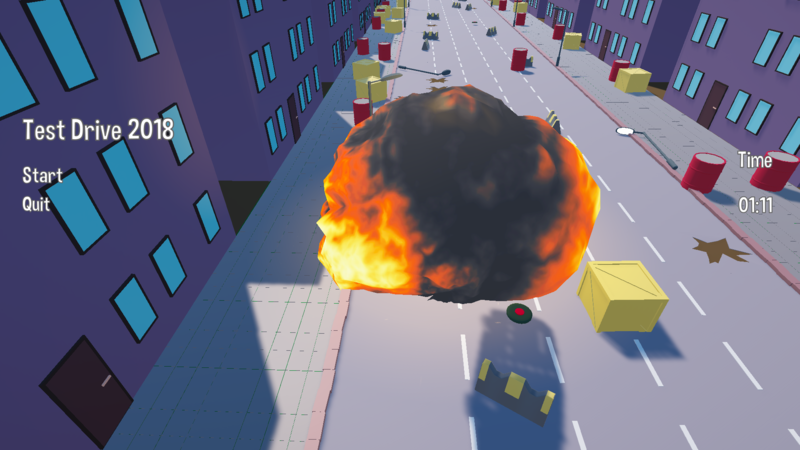 I think placing movable objects on the road instead of road block would have worked a bit better. 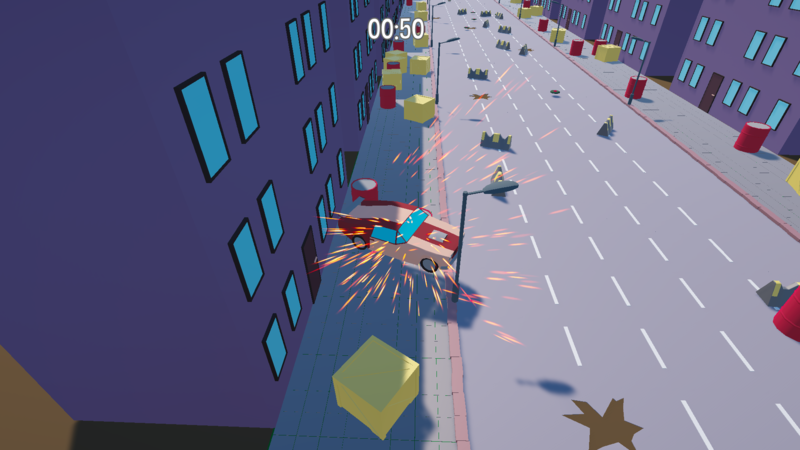 You wouldn't just use objects to bump the car onto the right path but have to pull some out from in front of the car. Neat concept and pretty good execution. 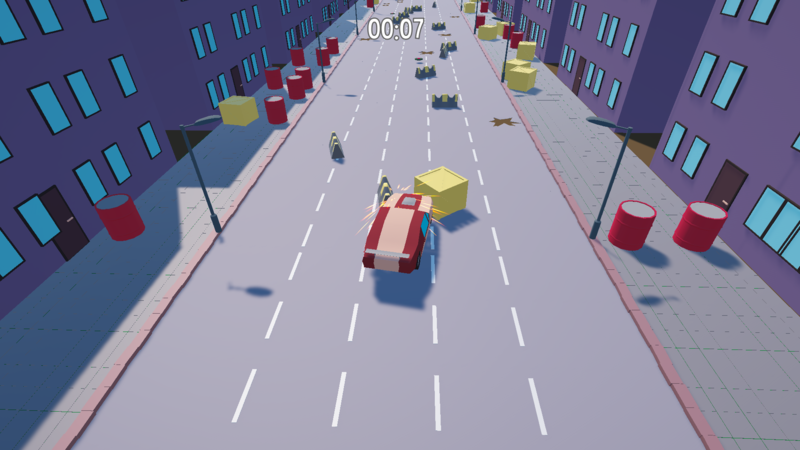 Main issue I had is hitting crates and barrels resulted in some pretty wild turns, which made it hard to plan ahead in terms of using them to avoid mines. Sweet lil game, good job! Although some sort of tutorial would be great. Nice one! Maybe limit the use objects while holding them, seems OP now. Amazing concept that goes really really well with the theme! He does drive quite slow though and that mixed with the speed loss he gets from being hit with a item really make the game kinda frustrating. I'd recommend bringing up the speed and make him not slow down as much when you hit him. Also it is not intuitive AT ALL that you're supposed to pick up the barrels and boxes, I had to come to the comment section to find that out. I would recommend making it more obvious. 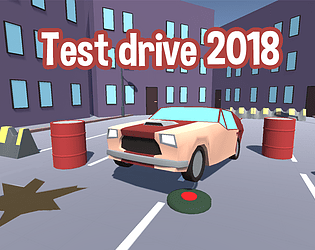 I am a huge fan of no tutorials and no text telling you what to hit so the way I would think best to do it is have the game start with with a bunch of barrels or boxes in front of car keeping him from moving. That way the player is very likely to try to move them with the mouse. I did try moving the road blocks with my mouse before I ever came to the comments to find out I was supposed to move the barrels. Altogether though I do quite like it and you did a really good job working with the theme! Great idea on the tutorial implementation, thanks for the feedback! I've edited the short description to give players a hint for now, given we're past deadline. Great concept and really fitting to the theme imo. The concept fits the theme very well, and the execution is great.